Wednesday is our day off. It was cloudy with a slight chance of rain- so we decided to hit the road. We left home and headed down Western Avenue to Oak Ridge. From Oak Ridge we traveled to Kingston and stopped at the Waterfront. Watt’s Bar Lake created from the Tennessee River. I’m never sure what to do in these pictures. Several people were stopped to feed the ducks. Jeff is ready to get on the road. After leaving the Waterfront, we headed south on 58 to Decatur. We saw a bunch of cars parked at a local restaurant and decided to check it out. Great country food at the Jones Street Cafe in Decatur! Just like Mom used to cook. After fueling up on food, we headed East on 30 to Athens, then North on 11 to Sweetwater. We also stopped and checked out the Sweetwater Downtown Memorial. What a great tribute! After leaving Sweetwater, we continued North on 11 through Loudon to Lenoir City then back to Knoxville. We had to gas up in Farragut, then hit the interstate on the final leg home. Our total ride was 140 miles and the rain held off until after we got home. After we got out of Oak Ridge, the ride was pleasant with mostly open roads- and very little traffic other than downtown Athens. The scenery south of Kingston is expansive with fairly straight roads- makes a great day ride. See our entire list of DAY RIDES by CLICKING HERE. 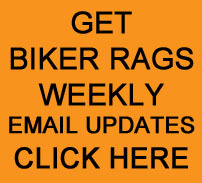 This entry was posted in Day Ride and tagged Biker Rags, Day Ride. Bookmark the permalink.